Hortus Camdenensis | Malus spectabilis (Ait.) Borkh. Fully-hardy, rounded tree with oval leaves, to 9cm long, and blush-pink flowers in spring, followed by yellow fruit, to 2.5cm across. To 10m. [RHSE, Hortus, Hilliers']. ‘The Chinese Apple-Tree [Pyrus spectabilis] when it blossoms in perfection, answers truly to the name of spectabilis; a more shewy or ornamental tree can scarcely be introduced to decorate the shrubbery or plantation; its beauty like that of most trees, whose ornament consists chiefly in their blossoms, is however but of short duration, and depends in some degree on the favourableness of the season at the time of their expansion, which usually takes place about the end of April or beginning of May; the flowers are large, of a pale red when open, and semi-double, the buds are of a much deeper hue, the fruit is of little account, and but sparingly produced. Trees of this species are to be met with in some gardens of the height of twenty or thirty feet. Dr. Fothergill is regarded as the first who introduced this Chinese native, he cultivated it in the year 1780; such plants of it as where in his collection; passed at his decease into the hands of Messrs. Gordon and Thompson, in whose rich and elegant Nursery, at Mile-End, this tree may be seen in great perfection. Though perfectly hardy, as its blossoms are liable to be injured by cutting winds, it will be most proper to plant it in a fhelter'd situation. It is usually increased by grafting it on the Crab stock.’ [BM t.267/1794]. ‘This is a most beautiful tree. 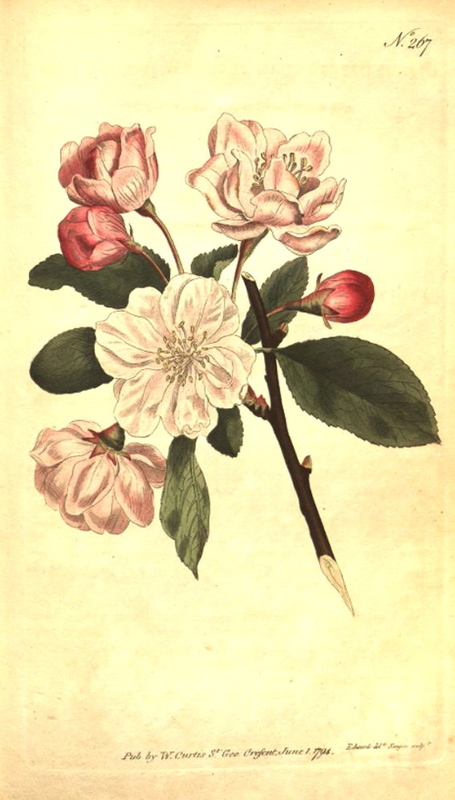 […] It flowers in April and May, and is perfectly hardy.’ [LBC no.1729/1833]. Listed in all published catalogues [T.793/1843]. More details about Malus spectabilis (Ait.) Borkh. Probably China, but not known in the wild.